"Half of the black beans in this spicy soup are pureed with tomatoes, the other half are simmered with carrots, onion and kernels of corn." In large saucepan, heat oil over medium heat; cook onion, garlic, and carrots, stirring occasionally, for 5 minutes or until onion is softened. Add chili powder and cumin; cook, stirring, for 1 minute. Add stock, 1 can of the beans, corn, and pepper; bring to boil. Meanwhile, in food processor or blender, puree together tomatoes and remaining can of beans; add to pot. Reduce heat, cover, and simmer for 10 to 15 minutes or until carrots are tender. 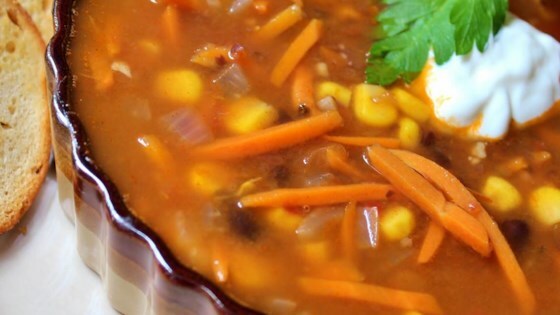 See how to make a zesty black bean soup that’s thick and hearty.